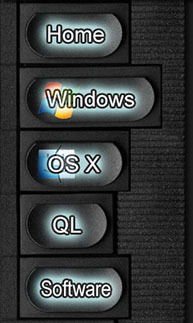 The QL was launched too early in its development for commercial reasons; the result was a system which was buggy and still unfinished. The first machines were delivered to customers with many months of delay, causing excessive press criticism. Despite its marvellous features, the QL never succeedeed in the mass market. Perhaps it was too expensive for hobbyists and lacked large and reliable mass storage for professionals. Third party hardware add-ons, software, and even some QL compatible computers started to appear in the rapidly growing QL market, giving more than reasonable tools to the users, and often repairing to some original QL's weaknesses, but it was already too late. 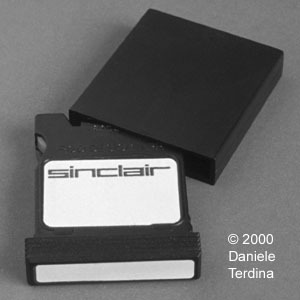 Forced by the QL's early failure, in March 1986 Sinclair sold its products and technology to Amstrad, which wasn't interested in the QL. Probably about 150000 units were sold in the brief and unlucky QL's life. Planet Sinclair has a an interesting article about the QL's history, and some more information is available on Wikipedia. 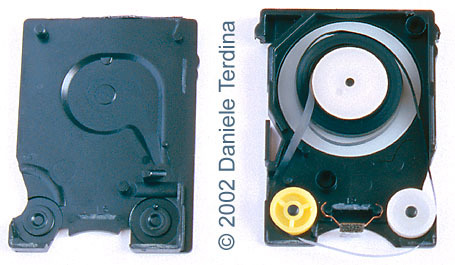 The tape inside a microdrive. 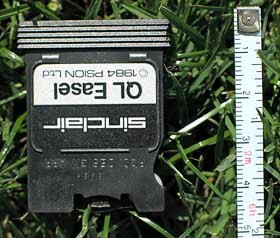 Microdrive cartridges are much smaller than floppy disks. 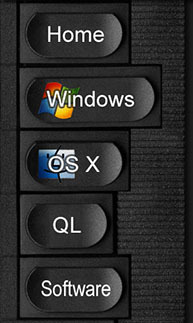 Every QL was sold with a suite of four business applications on microdrives. This page © 2012 Daniele Terdina. All rights reserved.